Among a lot of other state and national election results earlier this month, voters in Florida passed an amendment to automatically restore voting rights to 1.4 million citizens with felonies in their past. An incredible 64 percent of Florida voters voted in for the change. The amendment restores the right to vote for people with felonies in their past, except people convicted of a handful of the most serious crimes, once they have served their time (including probation and parole). Florida was previously one of just 4 states in the US (along with Kentucky, Iowa, and Virginia) whose constitutions permanently take voting rights away from all people with felonies in their past unless they’re able to take extraordinary measures to have their voting rights restored individual through a governor’s pardon. With the victory in Florida and the Governor of Virginia’s pledge to use his pardoning power to restore all voting rights to people as they complete their sentences, only Kentucky and Iowa are left with the most extreme felony disenfranchisement practices in the US and in the world. This big win has energized Kentuckians around restoration of voting rights and several organizations including KFTC are prioritizing our long-running campaign to restore voting rights to people with felonies in their past after they have served their debt to society. We can't stop now. Help build grassroots power for 2019. Today we kick off KFTC’s fall fundraising campaign. 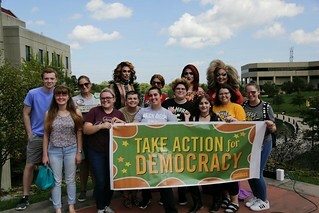 We're inviting everyone to support Action for Democracy. From June through election day, I talked with voters every week as a KFTC voter empowerment organizer. I took action for democracy because I wanted everyone to get out and vote for candidates who reflect our values and understand issues that affect us. I helped folks to not just vote, but know who and what they were voting for. Not everything went our way in this election, but 26 candidates endorsed by KFTC’s New Power PAC won their races. We challenged old guard candidates and made them talk about our issues and our values. We supported more women and people of color candidates. 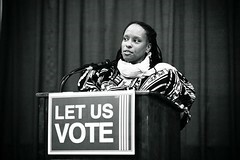 And KFTC members, voters and candidates gained skills to grow our grassroots power. Today we say thank you. Tomorrow, we organize. Tomorrow is Election Day – Tuesday, November 6. This is a critical election, unlike any other. Control of the Kentucky House, the US House and local governments hang in the balance, and tomorrow’s results will determine how effectively we can fight for our vision in 2019 and 2020. 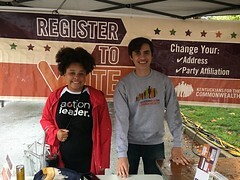 In this long election cycle we’ve registered thousands of people to vote and talked with tens of thousands at events, trainings, phone banks and more. But there’s still a few things you can do in the next day and a half that can make the difference. Learn about the candidates and vote. Polls are open 6 a.m. to 6 p.m. You can see what’s on your ballot, where candidates stand on issues, find your voting location and more at www.KentuckyElection.org. Make a plan now to vote tomorrow. Spread the word to friends and family. Call everyone in your cell phone tonight to remind them to vote; use social media to talk about candidates you care about; share www.KentuckyElection.org with everyone you run into between now and 6 p.m. tomorrow. It might feel like everyone you know is already voting and knows who they’re voting for – but some of them aren’t ready yet. You can actually make the difference for a lot of your friends. If you and all 12,000 KFTC members do this, we win big on election day. Volunteer. There’s still time to volunteer with your local KFTC chapter and call voters to mobilize them, pass out our voter guides, go door-to-door, and join in creative election day events like bike parades! 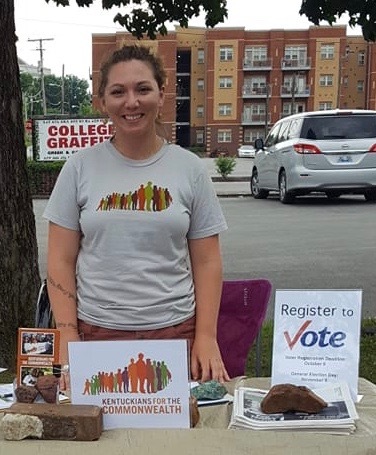 Contact your local KFTC organizer or reach out to our Democracy Organizer Dave Newton at 859-420-8919 or Dave@kftc.org to volunteer outside of chapter areas.